Published: Nov 1, 2011 to ? 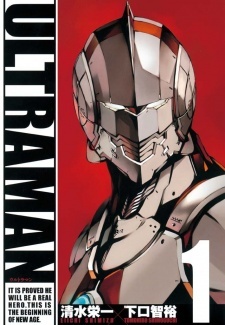 Ultraman has been published in English by VIZ Media under the VIZ Signature imprint since August 18, 2015 and in Brazil by Jbc since September 2015. The first volume started as a blast: very good story, good drawings, lots of kinetics scenes. In summary, a very good first volume. The author did a good job refreshing the character and explaining what is going on. The second volume, and following chapters, the story have fallen into a boring story that tried do add something new but failed hard. It is unclear the characters motivation to keep up on things. Also some nonsense fights and "pseudo enigmas" that failed on both sides: it could not be a good action mangá nor a investigative one. I'll keep reading. If the future chapters improve the quality, I'll change this review. The Giant of Light returns once more with a new look! This is a direct sequel to the original "Ultraman" television series. (1966) We follow the original Ultraman's son, "Shinjirou Hayata". The true "Ultraman" has left Shin Hayata's body and returned into deep space. Shin has been left with no memories of being "The Ultraman", but now has super-human attributes. The S.S.S.P. has developed suit that matches Shin's newfound superhuman abilities, and is very similar in design to Ultraman. Aliens begin to appear once more after an extended period of peace. Shinjirou now takes his father's place as the "Ultraman" as the abilities have been passed down to him as well and the S.S.S.P. has an exclusive power suit for him as well. Can Shinjirou fight off these new alien invaders and live up to the name "Ultraman"? Read to find out! This new Ultraman series only has the original television series as "cannon" , as if all of the sequel series do not exist in this new universe such as "Ultra-Seven" and the American "Ultraman". The creators do say that even though these series are not related, it does not mean that the characters are non-existent. I'll be honest, this series is not what I thought it would be. Giant Ultramen fighting giant kaijus in a city. Instead we get a man-sized almost "Iron-Man" Ultraman fighting human-sized aliens. There are many nods to the original series in terms of events and designs, but this is not that kaiju drama I hoped it would be. Maybe we will see kaiju sooner or later! But, what we get is very satisfying and I look forward to this new series! Fingered crossed for an anime-adaptation!